My trip to Beijing in April would not have been possible without Prof Dong, the Chinese scholar who has translated Tagore’s work in Chinese. His invitation gave me a chance to explore mainland China. Well, I was in Hong Kong as part of my assignment with China Daily Hong Kong Edition (2006-2009) and visited Shenzen and Guangzhou a number of times, but never did I get a chance to visit Beijing. When China Eastern airlines landed in Beijing on April 13, I was fascinated by the airport’s infrastructure. The capital’s stupendous development and the nation’s awe-inspiring thirst for progress took me by surprise. I boarded the airport express subway to reach Huangcunxidajie (the subway station is 20 minutes subway ride from Beijing downtown), where my friend Amitava was staying. My friend took a rented apartment there. He was on a scholarship tour for three months. I had read about Beijing’s mind-boggling progress, and the frenetic pace at which all development work is being done, but what I saw with my own eyes baffled me. What struck me particularly about Beijing is the scale and speed of work! How a nation was transformed from the late seventies when it started opening up its economy. “Never forget to visit Hangzhou,” said Prof Dong on my arrival in Beijing. Chinese people say: “Dishang Hangzhou–tien shang” (On top is Heaven, and down below is Hangzhou). Travelling to Hangzhou, for a Chinese, is a holy pilgrimage. On April 22, my friend and I took the Bullet train from Shanghai to Hangzhou (train fare 90 Yuan). It was only an hour’s train ride. The train’s swank interior and the seating arrangement are made keeping passengers’ comfort in mind. A hotel staff was waiting at the Hangzhou railway station. 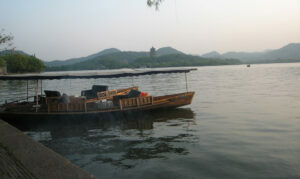 From the station, we took a cab to reach our hotel Hon Lieu, located very close to the West Lake (xi hu in Mandarin). It was 3pm when we checked into the hotel. My friend ordered two bottles of Siwo beer. Around 5pm we were out to see the Lake. Wow! I was bewitched by its beauty! West Lake area comprises the Lake and the hills surrounding its three sides. The Lake has inspired poets, scholars and artists since the 9th century. It comprises numerous temples, pagodas, pavilions, gardens and ornamental trees, as well as causeways and artificial islands. 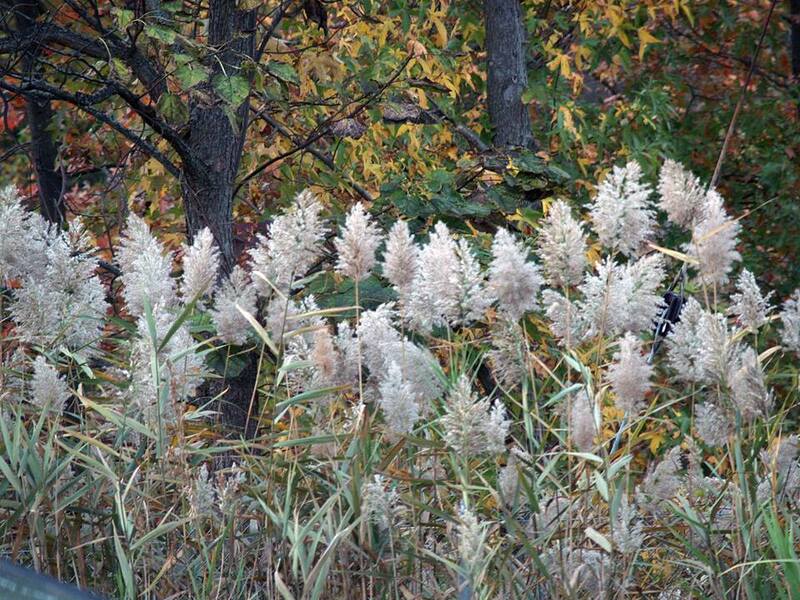 The additions have been made to improve the landscape west of the city of Hangzhou to the south of the River Yangtze. 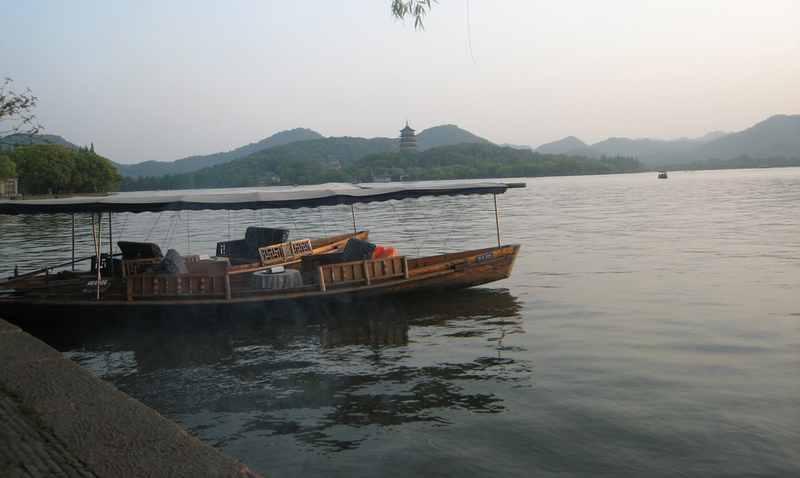 West Lake is an example of a cultural landscape that displays with great clarity the ideals of Chinese landscape aesthetics, as expounded by writers and scholars in Tang and Song Dynasties. The Lake’s landscape has a profound impact on the design of gardens not only in China but further afield, where lakes and causeways imitate the Lake’s harmony and beauty. Famous Song Dynasty poet Su Dongpo (960-1127) paid a rich tribute to the Lake when he compared the West Lake to Xi Zi, the most beautiful woman in ancient China. Tagore was captivated by the Lake’s beauty, serenity and tranquility when he visited Hangzhou in 1924. 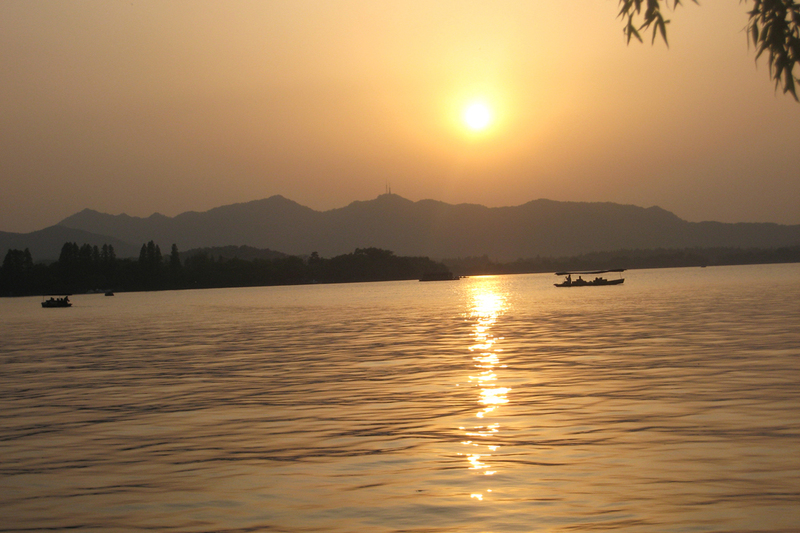 As the sun was setting over the calm and tranquil water of West Lake, it was a divine spectacle. 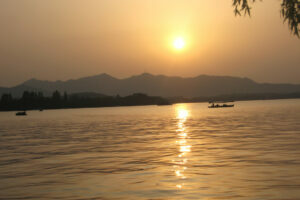 I thanked God for the nature’s wonder: Heavenly Hangzhou.